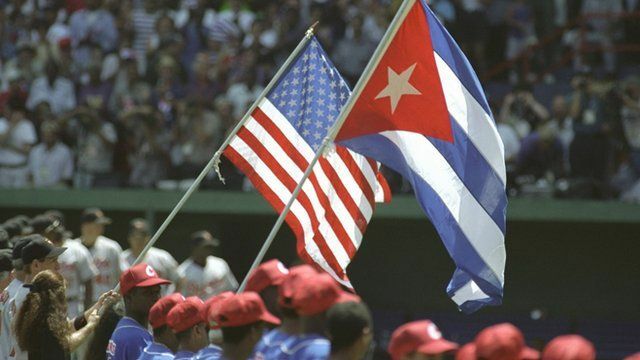 How US-Cuba baseball helped diplomacy Jump to media player In March 1999, communist Cuba's national baseball team played a US major league baseball team for the first time. During his ground-breaking visit to Cuba later this month US President Barack Obama will watch the Tampa Bay Rays play the Cuban national baseball team in Havana. It will be the first time a Major League American team has played on the communist-ruled island since March 1999, when the Baltimore Orioles faced the Cubans. Baseball fans in Cuba eagerly awaited that fixture, and the game was contested in a carnival atmosphere, with Fidel Castro looking on from the crowds. Cuban baseball star Enrique Diaz took to the field for the national team that day. He tells Witness about the highlight of his sporting career. Witness is a programme of the stories of our times told by the people who were there.